Sitting here basking in 32 degree heat, looking out over a balmy Darwin sunset in northern Australia I am wondering why anyone would ever leave this heavenly place. I’ve been in Australia for nearly two weeks and have loved every minute of it. It’s a truly fabulous country and it’s easy to see why so many Brits come here to live. It’s a very optimistic country and you get a sense of the optimism just by looking into people’s faces as you walk down the street. Strangers smile at you. They chat to you with ease. There are none of the scowls you get if you ever make eye contact with anyone on the streets of London. There’s none of the scepticism so prevalent in our society in the UK. This is a can do country with a positive attitude. The political part of my trip ended a week ago – I was here to deliver a number of speeches for Microsoft Australia, two of which were in Parliament House in Canberra. So with that part of the trip over with, it was time to do a little relaxing and sightseeing. The journey through the Hawkesbury River was stunning. The train never seemed to break more than about 50mph and it took three hours before we arrived in Newcastle. I had been warned that it wasn’t exactly a beautiful town, and so it proved. I wandered round the harbour area and up to Nobby’s Beach (yes, honestly) before waiting to catch a trolley bus tour of the town at 1pm. The trolley bus duly arrived and I turned out to be the only customer. The driver said he couldn’t take me on my own but would drop me at the town’s new maritime museum. Which he did. And it was closed. Buses in Newcastle are free, and all of them run virtually empty. There’s a lesson there somewhere. I was amused to see that the buses were going to outlying town suburbs called Morpeth and Wallsend! So back to Sydney I went, and enjoyed the scenic railway for a second time. In the evening I met Alice Wright for dinner in a wonderful Italian restaurant in Surry Hills. Alice was the floor manager at 18 Doughty Street and is now living in Sydney with her Aussie boyfriend. She is a speechwriter for the New South Wales minister for tourism. It was great to see her again and reminisce about all the programmes we made together. It was another early start on Tuesday. 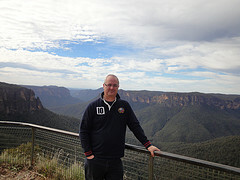 I was picked up shortly after 7am from my city centre apartment by a tour company who were taking me on a tour of the Blue Mountains. James, the tour guide, immediately told me the bus would be very full. “There are two of you,” he joked. And there were. Me and a Canadian girl called Angela. The advantages of travelling in the Australian winter. We started off by visiting an Aboriginal Cultural Centre and then headed up into the mountains. Stunning scenery and more than a little of the Grand Canyon about parts of it. We even saw some kangaroos. I know it’s pathetic, but that was the highlight. “Whatcha say, Skip? 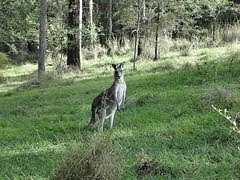 Grandma’s fallen down a mineshaft?” Readers of a younger generation won’t get that, but those of us who were brought up on Skippy the Bush Kangaroo will! On Thursday I flew up to Darwin to spend the weekend with Shane Stone, a friend of mine who is a former Chief Minister of the Northern Territory. It’s a four hour flight from Sydney. To give you some geographical perspective, Darwin is further from Sydney than London is from Moscow. It’s the dry season in Darwin at the moment and a very pleasant 30 degrees. We were joined by two of Shane’s colleagues and were immediately driven to Crocosaurus Cove where we saw some very big crocodiles indeed! On Friday morning we headed out to Channel Point, which is a 140 mile drive, mainly on dirt roads. It’s on the coast, opposite the Peron Islands and is a compound of about 20 properties. It’s totally isolated from anywhere. You walk along the beach and you feel as if you are about to star in an episode of LOST. I’ve never been fishing before, but that’s what people do here. All the time. All day. Except that the wind was too strong, thereby preventing us from going out on the water. But we fished in a creek and laid crab traps. I eventually learned how to cast a rod, but didn’t end up catching anything. But I did catch crabs. There’s a joke there somewhere. We headed back to Darwin this morning. I had to laugh at the start of an article in the local Darwin newspaper today. “Darwin is in the grip of winter. Temperatures descended to a chilly 25 degrees centigrade yesterday...” You have to laugh. We caught the afternoon flight back to Sydney. I’m now gearing myself up for the final week of my stay here, which will be dominated by broadcasting my LBC show every day from 4am-7am from the Today FM studios. And I am going to meet some long lost relatives in Sydney, I never knew I had. More of that another time. Have you eaten any crocodile yet? My daughter lives in the top end. You are right - the railways journey from Sydney to Newcastle is one of the greatest rides in the world. How many times have you heard the Ozzy catch phrase "No worries" uttered whenever you say "Thank you". Typical Australian attitude - so laid back. Hopefully their new Prime Minister Julia Gillard won't change that attitude, but its not looking good at the moment with no 18 rated video games, attempting to ban planking, and imposing stupid carbon taxes.